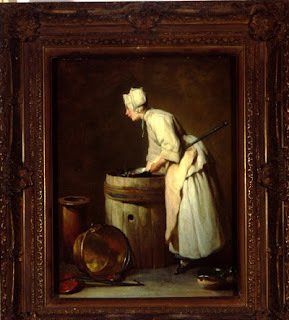 From medieval times until the early twentieth century, the scullery maid was basically the lowest of the lowely household/kitchen servants, responsible for washing pots and everyday dishes, scrubbing floors, boiling water, and performing other such unsavory tasks as plucking chickens. The position is one that has (fortunately, I think) generally gone the way of the horse and buggy, but somehow I recently managed to find work as a scullery maid. Yes, that's right - a Brown University diploma, a year of the MBA program at Darden, and impending matriculation into a Top 10 law school has landed me a position as a scullery maid. Well, technically, the position is "Assistant." And it's actually kind of fun. A few months ago, the Wine & Cuisine Club (WACC....B-school humor at its finest - hahaha! ) at Darden took a cooking class through the Charlottesville Cooking School, which also hires folks to fulfill the scullery maid function in exchange for either pay or free classes. So for a couple nights in the past month, I've donned an apron and some gloves for 4+ hours after putting in my time at the internship. While there is a LOT of dishwashing (particularly for the sauteeing class), I also get to listen to most of the class, and the assistant/scullery maid always gets fed part of the meal that the class cooks, too. All in all, it's been a pretty neat experience (for dishwashing), since I learned some new knife techniques and recipes, and I'm looking forward to signing up to take some classes myself - I earned them, after all!